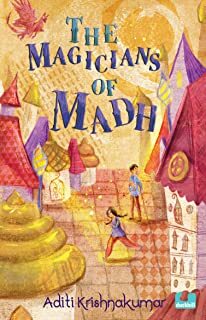 The Magicians of Madh is set in the sort of independent city state you see in quite a lot of fantasy, and so is immediately familiar. Krishnakumar knows you know this. Madh is full of hooded and cloaked figures, improbable architecture, competing and tax-avoidant temples, and more than the usual quantity of supernatural beings. The city’s skyline is dominated by the Academy (not actually the tallest building), where young people study magic and alchemy, as well as maths and philosophy. The assassins who roam the streets have, pragmatically, unionised. It’s all rather Terry Pratchett, and that is generally a good thing. Strange events are taking place across the city; evidence of powerful magic but with no trace of who the practitioner/s might be. Teenage genius Meenakshi, along with her more practical foster brother Kalban, undertakes to find out what, who, and why. I’d assumed from the back cover, and the fact that the book is squarely aimed at a middle-grade readership, that the Academy was a magic school, a setting that I thoroughly enjoy. For a while after the book opened, I found myself slightly disappointed that I wasn’t getting all the educational scenes I’d hoped for—and then I realised that what I was actually reading was magic university. There’s space here for another call back to Terry Pratchett, but it wasn’t the one that felt most immediate to me. I have no way of knowing whether Krishnakumar has read Diana Wynne Jones’s Year of the Griffin, but some of that book’s (and to some extent Dark Lord of Derkholm’s, which it follows) sense of university life unfolding in the plot’s background, of deep immersion in personal projects, academic rivalries, earnest and ridiculous debate, awkward relationships with irascible supervisors, and university social life (there’s even a Disembodied Voice Society, which I love), is present here as well, and is genuinely charming when it happens. (Also there are griffins.) The city in the background can sometimes be a bit of a gimmick taken too far (In other cities people would run away from danger! In Madh they run towards it! In other cities you’d look conspicuous all hooded and cloaked! Here you pass unnoticed! ); the university is less of a genre parody and more a space in which people live and interact, and possibly even work. There might be a reason for that (and note that this is a mystery story, and anything mentioned here may have relevance to the solution). The Academy is enchanted, in a very particular way, so that how it appears to each person is constantly changing, and no one has ever seen what the building itself looks like. Most often, as the characters creep through its corridors, it seems to look rather dungeonlike—dramatic and medieval and rather too dark. It’s giving its students the sort of portentous, pseudo-medieval setting they expect, as well as the one we expect—as the book does in its broader descriptions of Madh, it’s working with, building on and undercutting its audience’s expectations of what this sort of setting looks like, and what sort of genre this is. And then events transpire so that we do see the Academy’s true form. It’s only described briefly; the characters find themselves in a room whose “floor was tiled in polished stone and the walls and ceiling painted a pale neutral cream.” Not much there, but shortly after Kalban describes the experience as seeing the Academy while it “looked like a government building designed by an architect in the middle of a minimalist phase.” I love this. For multiple reasons: I like the sort of building this seems to suggest; I like that Madh is the sort of world that might plausibly have minimalist government buildings; and I love how familiar, how immediate, and how Indian such a building feels to me. Calling it “Indian” feels important given that all my references to other works thus far have been British ones–the names are Indic (Meenakshi, Chitralekha, Paras, Nalini), but is there more to it than that? Fantasy (or at least a certain sort of fantasy) in India faces something of a challenge when it attempts to build worlds that draw on the national past. (I can’t let that sentence pass without noting that medievalist European fantasy has been weaponised by Nazis more than once, including very recently, so the problem is not unique to us.) So much of Indian history, myth, folklore has been co-opted into a Hinduist narrative that a story that tries to use those things risks being co-opted in similar ways. I don’t know whether Krishnakumar is actively trying to negotiate this situation, but if she is she comes up with some appealing solutions. Madh has its elements of Hindu mythology—a “Celestial Dancer” (Krishnakumar chooses not to say “Apsara,” but she’s not hiding what Chitralekha is—or for that matter her superiors Rambha and Urvashi) is one of the major characters, dividing her time between trying to solve the mystery alongside Meenakshi and irritating Kalban. It’s probably more a case of shared sources than a deliberate allusion, but the name of the neighbouring kingdom, Melucha, kept reminding me of Amish Tripathi’s Immortals of Meluha–fittingly, as Melucha seems a more traditional mythic kingdom. And then we have the academy, and its blocky minimal-ness and suddenly I’m at home in a completely different way. I’ve spent most of my life in a country many of whose public institutions were built in the mid-twentieth century, and whose architecture reflects that moment. I’m suspicious of schools that want me to notice that they look like Hogwarts; I like a medieval castle in its place, but I’m suspicious of what about its old-ness I’m being asked to admire. Madh is–fundamentally–a post medievalist world, one into which government buildings just fit naturally. There may be some of the trappings of medievalism in its material culture (why are people wandering about with bows and arrows? ), and Kalban in particular may be used to a court full of intrigue and assassination (I’d love to read fantasy set in Melucha, but I’m glad it’s offscreen in this story); but it’s no accident that the book’s appendices consist of a chart depicting the structure and hierarchies of Madh’s bureaucracy where many other fantasies would have family trees and glossaries. It seems the India I want from Indian fantasy is a post-independence one. I realise that Krishnakumar probably did not set out to create a Nehruvian alternative to mythological fantasy, and I’m okay with that knowledge. My feelings about buildings and bureaucracy aside, I’m not completely sold on this book. A couple of years ago I complained about another Indian fantasy that was aimed at middle-grade readers that it felt incomplete, as if there’d been several more chapters of backstory and worldbuilding. There’s a similar feeling of incompleteness about this book, and it has a bigger effect on me when I read. I describe the book above as a sort of mystery/detective novel–there are lots of small background details that turn out to have a real bearing on the solution. But in order to participate in the working out of the solution we need a basic understanding of how the world and its magic work and we don’t, quite. I have no idea whether Krishnakumar plans to write more books set in this world; if she does the main attraction for me would be that gradually I might come to understand this world better.